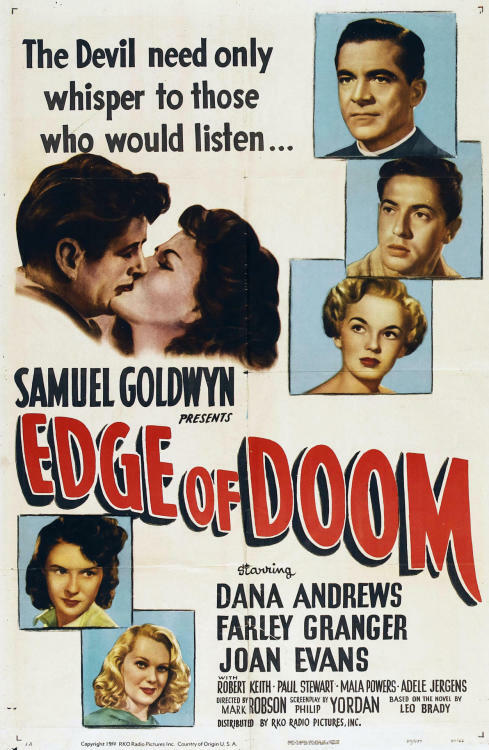 Edge of Doom is a flashback noir in which Father Roth (Dana Andrews) uses an anecdote of his past experience as a pastor in order to convince his young fellow pastor from leaving. They’re pastors in a poverty-stricken neighborhood, and the younger pastor wants to be moved because he finds the hardened people there difficult to deal with. The tale that Father Roth tells is a gloomy one, about Martin Lynn (Farley Granger), a man who falls into a devastating criminal act after the death of his beloved mother, who he didn’t have the money to save from illness — and also doesn’t have the money to provide a nice funeral for. The use of the word “doom” in the film’s title certainly suits the mood throughout. It’s just gloom, gloom, gloom up until the very last minute. It seems that nothing positive can or ever will happen to the characters. While this mood is certainly effective in evoking emotion from the viewer, it makes the film a bit of a chore to watch by the end. It leaves the viewer sad, rather than with the feeling that they just watched a great film. Granger could use a bit of work here as well. His performance is stiff. This may have been deliberate; After all, his character faces many hardships, and who wouldn’t turn to stone after what he has experienced? Problems aside, I still enjoyed watching this film. The grim, gloomy air is not all bad. Sympathy is drawn for Granger despite all of his stone-cold delivery. Andrews and the supporting cast are also effective here. In true film noir style, the film is visually wonderful as well. Shadows are nearly a character themselves, and the dark lighting only adds to the overall mood of the film. I’ll end with a random factoid. Portions of this film seem to have been filmed on the same apartment set as Where the Sidewalk Ends*, which also stars Dana Andrews. Ironically, in that film, Dana was doing the killing; here, we see Granger’s character end up in a similar predicament, in the same apartment. The films were also released in the same year.